ACTRESS and writer Amy De Bhrún was so blown away by the story of West Limerick’s pioneering aviator, world athlete and socialite, Sophie Peirce-Evans, she wrote a play about her. The play, I can see, has been running in a Dublin theatre for the past fortnight with Amy herself playing the part of Sophie Peirce-Evans. But the curtain comes down this Saturday. “We have had great audience response,” Amy said, speaking to the Limerick Leader from Dublin. And she is especially pleased that people are leaving the theatre and turning to the internet to find out more about Sophie or Lady Mary Heath as she preferred to be known following her second marriage. Amy was first introduced to Lady Heath’s story by a friend who wanted Amy to write something for the launch of Herstory, a movement designed to raise awareness of women in Irish society and Irish history. “When I started reading about her, I couldn’t believe she had achieved so much but was so forgotten,” Amy explained. She also admired Lady Heath’s refusal to dumb down or to be anything but herself. In a man’s world, Amy explained, Lady Heath piloted planes but still wore her jewels. “She was such a trail-blazer and by forgetting her, we are doing a disservice to the women of today,” she declared. Amy first wrote a monologue about Lady Heath but subsequently expanded it into the play I can see. Along the way, she discovered her grand-aunt Mary O’Donnell could remember hearing about Lady Heath when growing up in Limerick. Amy’s great-grandfather John (JJ) O’Donnell was from the Kilmallock area and was a creamery manager at Ballyneale. “When I first started to write about Lady Mary Heath, I didn’t want it to become a history lesson. I wanted to transform it into art,” Amy explained. Hence the juxtaposition in the play of two stories: that of Lady Mary and that of a modern Mary. To Amy, Lady Mary was a high-achieving woman who had “sunk into the walls of history” while the modern Mary also found herself sunk, in an abusive relationship. There are, she explained, parallels between them and one inspires the other. Now that she has done her part to bring Sophie Peirce’s achievements to a new audience, Amy hopes to tour the play next year and a return to Sophie’s home place of Knockaderry and Newcastle West is not ruled out. Meanwhile however, the actress whose film and TV appearances include Jason Bourne, The Crown and the Dragon, Vikings and The Cured, is looking forward to her debut appearance as Adele on Coronation Street this Friday. It will, she said, be the first of four episodes in which she appears. But further future appearances are not ruled out in this, most long-running of soaps. Lady Mary Heath was born Sophie Peirce Evans in Knockaderry in 1896 but her father John murdered her mother Kate, bludgeoning her to death before making off to Cobh, then Queenstown with his baby daughter. He was arrested there and sent to a mental asylum while Sophie was reared by aunts in Newcastle West. Among her achievements, she set two world records for the women’s high-jump and javelin and campaigned successfully for women’s sports to be included in the Olympics. 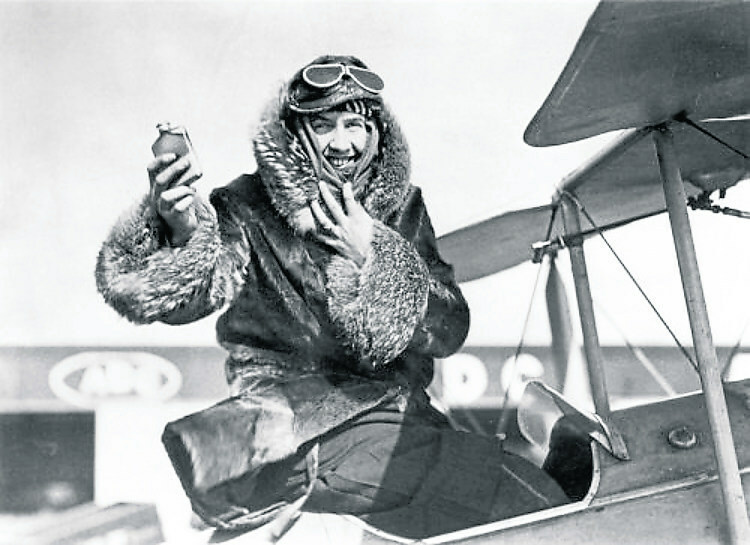 She was the first woman in Britain to hold a commercial flying licence and became the first pilot to fly an open-cockpit plane from Capetown to London. She married three times. With her third husband Jack Williams, she the old Iona National Airways and Dublin Air Ferries but the company went bankrupt and she returned to London where she died, aged just 42, after a fatal fall on the steps of a tram.